Address: Pedro Barba, 16, Puerto del Carmen (Lanzarote), Islas Canarias. 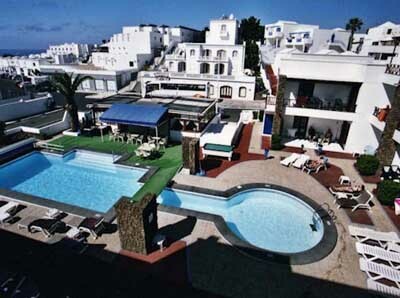 Centrally located in Puerto del Carmen, Club Atlántico is just 200 metres from the beach, and features a heated outdoor swimming pool and children's pool. Free WiFi is available throughout the property. Each apartment is south-east facing and offers pool views from its balcony or terrace. They have a lounge with sofa bed, a full bathroom and a kitchenette with ceramic hob, toaster, microwave and kettle. Apartments also have satellite TV with a range of international channels. The Club Atlántico also has a poolside club house and there are plenty of sun beds available for relaxing by the pool. Every Friday there is a barbecue for all guests, and there is live entertainment on some evenings. The multi-lingual reception staff can assist with car and bike rental, organising trips and more. Puerto del Carmen is well known for its restaurants, bars and shops. Lanzarote Airport is about 10 minutes’ drive away. Please note that the reception closes at 16:00, but guests can still check in until 22:00 at the property bar. For arrivals after 22:00, guests must contact the accommodation in order to receive a check-in code.